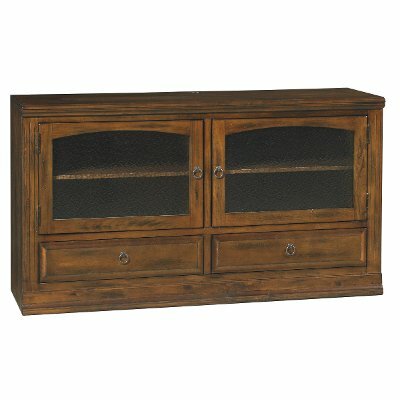 RC Willey offers this washed brown 6 piece traditional entertainment center from the Santa Fe collection. This transitional, rustic-inspired piece features a rich dark chocolate finish, beehive glass doors on the console, and offers plenty of storage space. Included in this unit is a 68" hutch, 63" console, left & right pier bases, and left & right pier hutches. 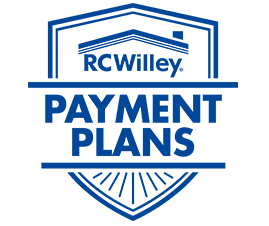 RC Willey helps you make your home your way. Dress up your entertainment area with this 63 inch distressed chocolate brown TV stand from RC Willey. This transitional, rustic-inspired TV stand features a rich dark chocolate finish, beehive glass doors on the console, and plenty of storage space. Pop some popcorn and enjoy a relaxing movie night in front of this beautiful piece of furniture. Washed Brown 6 Piece Traditional Entertainment Center - Santa Fe is rated 4.4 out of 5 by 7. Rated 3 out of 5 by MarioVegas Nice entertainment unit The set is nice, I had a problem with the delivery guys that left a 5" scratch on my hardwood floor in their rush to deliver. Later I realized one of the side bases was not properly aligned with the console. I called the customer service and they had another base unit sent to me, which was a little better, still not perfect. I was suppose to be contacted by somebody from RCWilley about the scratch on the floor, never happened. Rated 5 out of 5 by ShoppingCountry TV Console and base piers This item has everything you need in a TV console. The doors are great to keep dust off o the components, the drawers are so handy to keep CD's and DVD's neatly. The drawers come pre divided to fit the CD's and DVD's. The unit is wood and the rustic look is perfect for where we live. It also has pre cut holes for all the wiring to go through the back to be hooked up to the TV making all the wires neatly tucked away. This unit also has an assortment of matching tables. GREAT unit! Rated 5 out of 5 by Caren Entertainment center I love this entertainment center.It can accomodate up to 60inches tv.The tv stand itself is higher than the regular tv stand on most entertainment center.It also has a lot of storage.I highly recommend this product! Rated 5 out of 5 by cobr85 Great entertainment center We were looking for an entertainment center that could keep DVD's and other decorations out of the reach of our young son. This fit our every need. The drawers are perfect for DVD's and also just hard enough to open that the baby can not pull them open (not yet anyway). Rated 5 out of 5 by Farr Great Buy! We just bought this over the holiday wkd sale. There is NO assembly - comes in box(es). We bought the 3 base pieces. The wood/finish works great in our living room & is very sturdy. Has a ton of space & the drawers are ball bearing - they pull all the way out. We just love it! Rated 4 out of 5 by TQL670 LOOKS GREAT After completing the set-up this entertainment center looks great.